Today we’re continuing our theme from our last blog and going over the basics of Google Shopping ads! Just to jog your memory on what Google Shopping ads are, I’ve done a quick search for “the north face jacket.” The top portion of the results have 2 types of ads. 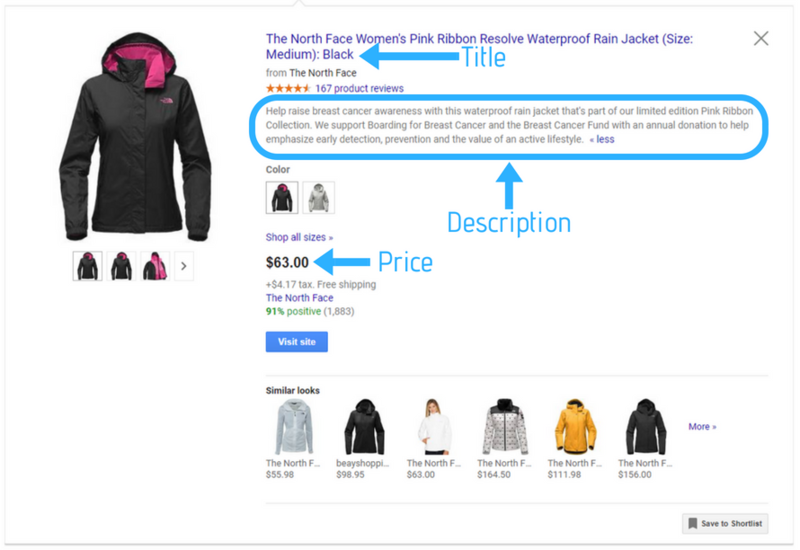 You’ll be able to differentiate your Google Shopping ads (also known as product listing ads or PLAs) because they’ll feature a photo and price of a product while your search ads are solely made up of text. Shopping ads can either show on the right side of the search results as they are in the image below or in a single line above the search results. In each ad, you’ll see an image of your product, a title, price and sometimes an extension with a promotion such as “Lifetime return policy.” If you expand the Google Shopping results or move over to the Shopping tab, you can see even more information about each product. 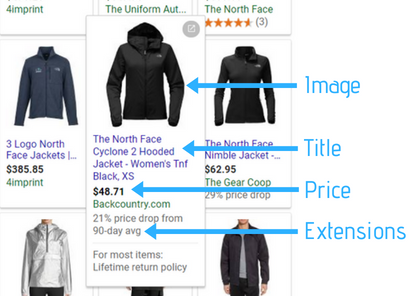 In the example above, I went into the Shopping tab and expanded one of the product results. Here you can see the title, price and some of the other information that can be seen on the search results page, but this view also shows a full description of the product. 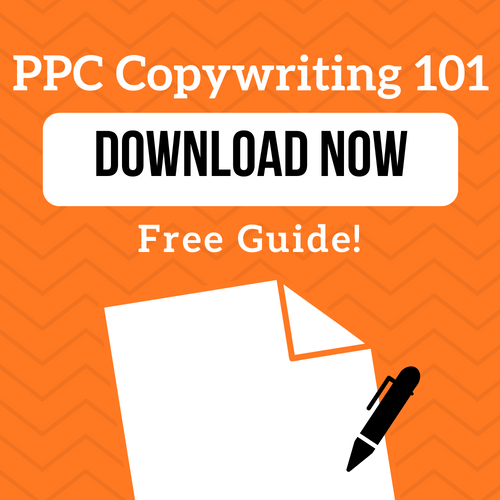 There are a few parts you’ll need to consider when setting up a Google Shopping campaign. The first thing you’ll need in order to set up your campaign is a product feed. Your product feed basically translates all of the product listings you want to advertise and puts them in a format the Google can understand. We’ll go more into what you’ll need to include in your feed, but this feed will live in your Google Merchant Center account. Once you have your feed uploaded to your GMC account, you’ll need to link this account to your Google Ads account and create a shopping campaign in Google Ads that pulls from your feed. The following fields are the bare minimum required by Google Shopping; there are even more requirements for some industries. We go into your feed requirements in even more detail in this post. There are a few ways to set up your feed. If you don’t have a lot of products you want to advertise, you can manually input each of the fields above into an Excel spreadsheet. However, if you do have a large product offering, you realistically wouldn’t be doing this by hand. Some ecommerce platforms, such as Shopify and BigCommerce, offer solutions that will automatically pull your products and put them into the correct format for Google Shopping. If your platform doesn’t have this capability, there are also third-party tools that will do this such as GoDataFeed. 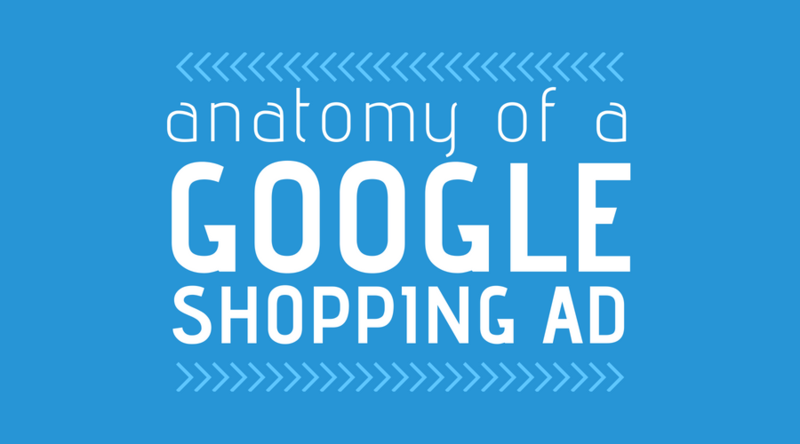 How do Google Shopping ads actually work? 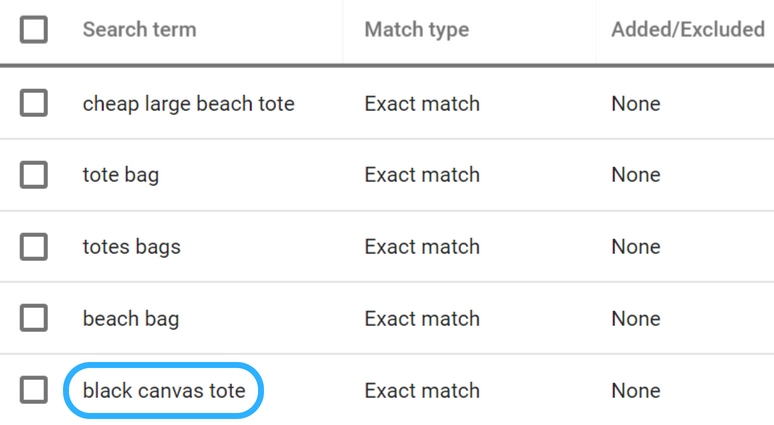 As you’re going through your search terms report, you notice that your ads are showing up when users search ‘black canvas totes’ even though you don’t actually sell any back canvas totes. Since you don’t sell this product, you’ll want to add this in as a negative keyword so that your ads don’t show when someone searches this in the future. Similar to search campaigns, Google Shopping also does involve bidding. 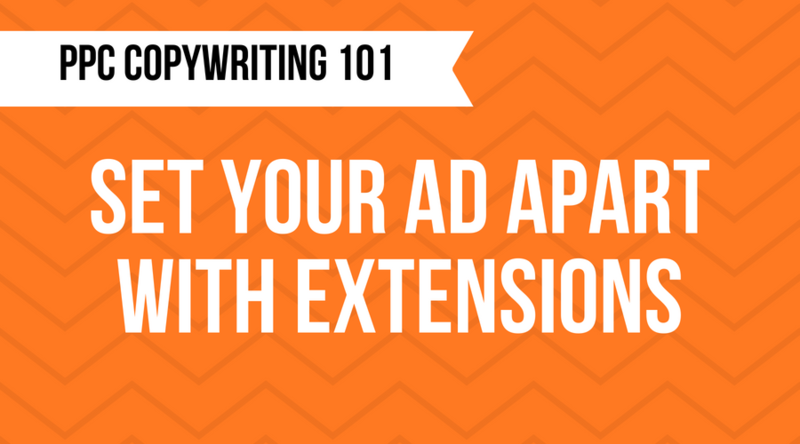 This allows you to control how often your ads are shown for different products. 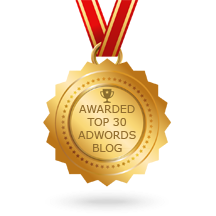 For example, if one of your products is driving a lot of conversions in Google Shopping, you might want to increase your bids for this product to maximize these results. Google Shopping can be a little confusing at times, but it’s definitely worth getting familiar with. According to a 2018 study “product listing ads (PLAs) generated 60 percent of retailers’ Google search ad clicks.” If that doesn’t convince you to jump onboard with Google Shopping, consider a 2017 Merkle report that showed that Google Shopping ads had 21% higher conversion rates than non-brand text ads on mobile and 30% higher rates on desktop. Did you know that LXRGuide optimizes your shopping campaigns as well as search? Schedule a free demo today! 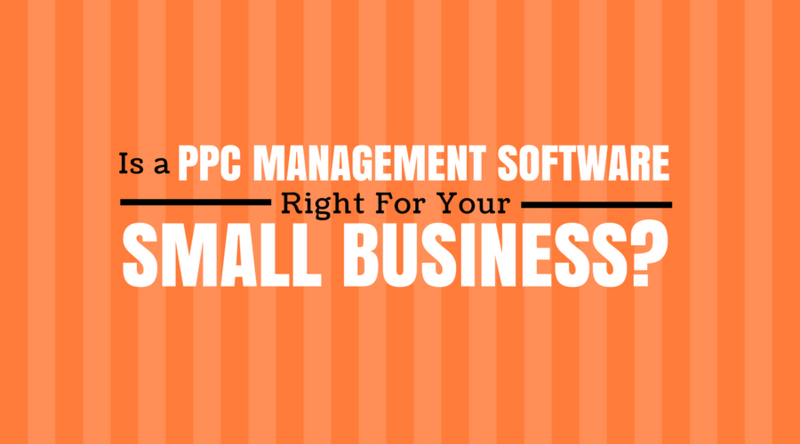 Part 1: Why You Should Set Up a Google Shopping Campaign Part 2: Google Shopping: Setting Up Your Product Feed in Google Merchant Center PPC Copywriting 101: Set Your Ad Apart With Google Ads Extensions Is PPC Management Software Right For You?